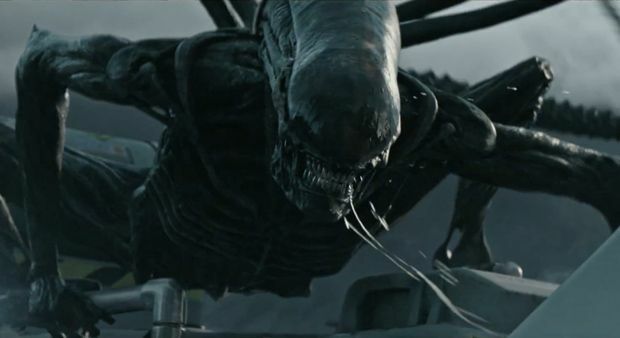 Whatever one hopes or dreads from this sequel to Prometheus, prequel to Alien, you can always count on Ridley Scott, creator of worlds, to serve up fantastic visuals and tell his story well. Whether it's the story you want to see depends where you are on the Alien-ometer — from tired of it all, to on the fence, to complete obsessive. It's very well done, but is it strictly necessary? A cool, dispassionate opening scene that is in tone more Kubrick than Scott sees the return of an uncredited Guy Pearce as Peter Weyland, the Alien-verse's brilliant billionaire founder of the sinister company bearing his name; he's discussing creation, life and death with his unnerving prototype sentient 'synthetic' David (Michael Fassbender). The problem with this for any Alien veteran is that you fully anticipate some version of the acid-bleeding lobster-like critters originally designed by HR Giger to set about the crew, it's only a matter of when and how. There are so many crew members, most of them dispatched like Star Trek redshirts, without ever grasping who they are or caring, except to gasp or shriek at the many ingenious variations on grisly death. Billy Crudup is a welcome presence as the captain, Oram, so anxious to be liked and respected he listens too much to his crew's impulses and not enough to his strong, sensibly wary second, Daniels (Katherine Waterston, inheriting the Alien mantle of gutsy heroine). This is closer to the original film than any other instalment in the franchise — leaving one wondering if there is anywhere to go from here — with numerous knowing nods to the 1979 classic. Fans will fall on these with delight and will no doubt be very happy to have at least one ongoing mystery in the Alien universe explained. For those who would have preferred the 'perfect organism' to remain inexplicable, the most fun aspect of the film is seeing Fassbender fighting with, or kissing himself. Otherwise it begins to feel like we have not only come full circle but are now spinning in an endless orbit of repeated lines, images, and frights. General release from Fri 12 May. The spaceship Covenant ends up on an unknown planet littered with little egg things, which can’t be good. The latest in the franchise is basically an excuse for Scott’s fantastic visuals and a series of more or less ingenious variations on grisly death, although some will enjoy the spectacle of Fassbender kissing himself. Really good movies.I liked...Ridley Scott is amazing producer.